What is the monteregie? Everything south of Montreal, with a big chunk of east and west of Montreal also. We'll focus on south of Montreal for today. The Monteregie region's bike path map is excellent. Let's look at the pistes cyclables one, since this is the easy way to plan a good road + bike path ride. Does this stimulate your imagination for a bike ride? Perhaps this helps the visualization process? No problem, this is a very enjoyable ride to split over two days (say, any weekend from may to October). Auberge Harris has made it's business success by focusing on people doing exactly this ride. 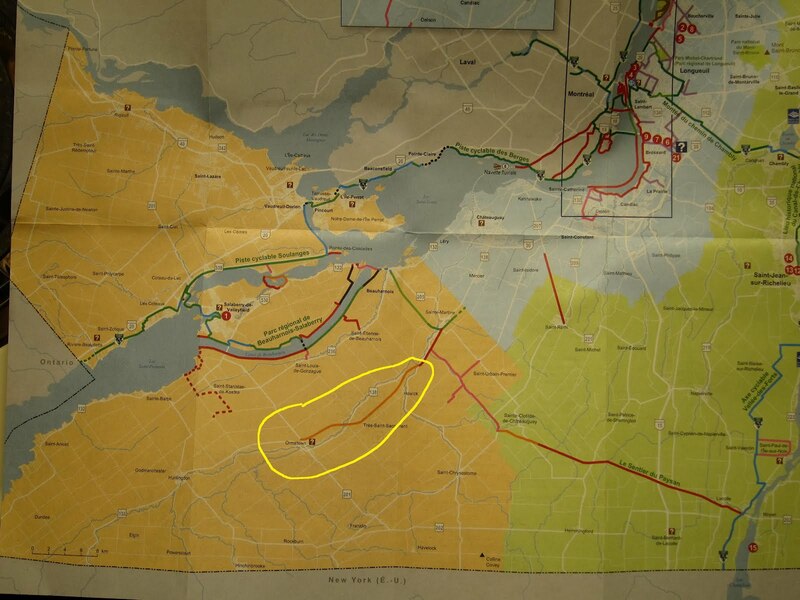 Note that you could start in Montreal and do the ride via chambly too. This is a very nice ride over gentle terrain with great scenery. Highly recommended. Bike route network now connects the St-Laurence and Richelieu rivers. This should be a popular ride. Note that a bit of it is on crushed stone/rock dust surface.